"We believe these actions are both morally and economically misguided, and will inflict irreversible harm on the startup community and America's ability to compete globally." They also offered a defense of the tech industry's use of H-1B visas for high-skilled workers. Some in Trump's circle have been critical of the program as bad for American workers. "The fact that so many startups rely on H-1B visas only serves to illustrate [how important the program is to the industry], since no sensible, time-constrained startup would opt to rely on a bureaucratically difficult process for hiring foreign-born employees if simply hiring qualified American workers was an option," they said. Who signed: Investors like Ron Conway and Dave McClure, as well as companies of varying size — including streaming video platform Vimeo and Pinterest. The bigger picture: Tech companies have aggressively pushed back against Trump's immigration restrictions, as they face the impact of the executive order on their workers and pressure from customers and employees to speak up. We are a group of startups, entrepreneurs, investors, and innovators who believe that immigrants, and the diversity of experiences they bringto this country, are essential to America's economic growth, progress, and innovation. We are deeply troubled by the recent Executive Order banning citizens of seven countries and refugees from entering the U.S., as well as the recently leaked draft Executive Order suggesting plans to roll back worker visa and parole programs. We believe these actions are both morally and economically misguided, and will inflict irreversible harm on the startup community and America's ability to compete globally. The American startup ecosystem has always welcomed people of all backgrounds and origins. The global preeminence of the U.S. technology sector has been driven in a large part by immigrants and their creation of and contributions to American startups. Many of the most successful technology companies were founded in whole or in part by immigrants, including Uber, Palantir, and Tesla. As of last year, more than half of the startups valued at $1 billion or more in the U.S. were established by immigrant entrepreneurs. Limits on the movement of immigrants—including lawful visa holders—into the U.S. based on their nationality or religion not only seed fear and uncertainty for our friends, families, and coworkers, but arealso antithetical to American values and sends the message that the U.S. is no longer open for innovation. Every individual turned away or dissuaded from making America his or her home represents a potential employee or entrepreneur who will no longer be able to contribute to the success of companies in America. We are also concerned that the new visa guidelines outlined in the draft Executive Order would harm the startups that rely on foreign talent to grow and thrive. The order calls for the evaluation and rolling back of various worker visa and parole programs, and is based on the concerning and misguided presumption that visa programs are harmful to American workers and the broader economy. In reality, it is well-established that immigrant workers at all skill levels make a positive impact on the U.S. economy. Research that specifically analyzes the impact of H-1B workers has found that for every 100 immigrants with advanced degrees in STEM fields, an additional 86 jobs are created among U.S. natives. Consequently, in limiting job opportunities forimmigrants, your administration faces the possibility of reducing jobs for American citizens, in addition to suppressing growth in the startup economy. Startups depend on the talents of immigrants to address significant shortfalls in the availability oftechnical, skilled IT professionals. The fact that so many startups rely on H-1B visas only serves to illustrate this fact, since no sensible, time-constrained startup would opt to rely on a bureaucratically difficult process for hiring foreign-born employees if simply hiring qualified American workers was an option. Additionally, we would advise against further restricting foreign students' ability to enter the American workforce upon completing their degrees from U.S. universities. These proposed limits are based on a misunderstanding of the impact these international students have on the experiences of U.S.-born students. As anyone in a startup incubator or accelerator can attest, working in a community of the best and brightest improves outcomes for everyone involved. Any actions to limit the availability of these and other high-skilled worker visas will only serve to stagnate growth in the tech sector and across the American economy. Finally, based on our understanding of the draft Executive Order, your Administration appears to reverse the recently finalized International Entrepreneur Rule. As noted above, immigrant entrepreneurs have contributed immensely to the success of the American startup economy, and we believe that the government should make it easier, rather than more difficult, for the world's brightest and best to start and grow their companies here. Encouraging innovators from around the world to launch businesses here is one of the best ways to create jobs in the U.S. 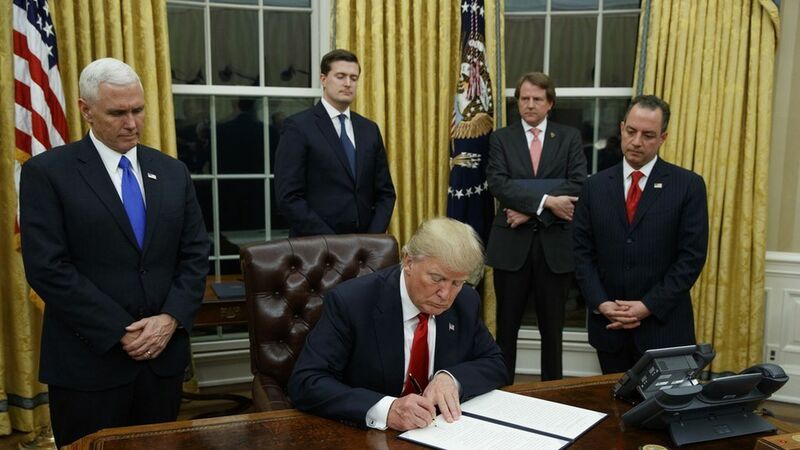 While we recognize the importance of promoting national security and protecting the interests of American workers, we strongly believe that the existing and proposed Executive Orders will not accomplish these goals and in fact, could undermine our ability to found and grow new companies that create jobs here in the U.S. We urge you to reconsider these actions and their impact not only on American values, but also on America's economic future.